This past weekend, Cool Springs PBC in Danville, GA was privileged to have our annual March Meeting. In an abundant display of rich grace and mercy, God opened the storehouses of heaven unto us all weekend. Just one brief glimpse of the goodness of glory is far more than we deserve, but He delivered exceeding abundantly more than that with display after display throughout the course of the services. Elder Mark Quarles, pastor of Providence PBC in Stringer, MS, was invited to preach for us, and God delivered him mightily. Brother Mark’s demeanor is generally known as one of great kindness and Christian warmth, and that noble character meshed beautifully with the messages that God had in store for His people in this portion of His vineyard. Starting on Friday night and continuing through Sunday morning, Brother Mark was delivered to preach a series of sermons on the life of Joseph and show some of the rich types and parallels between Joseph and our Lord Jesus Christ. While he confessed several times that he did not plan to bring this series of messages on Joseph, it was abundant that he followed the impression and direction of the Holy Ghost. During the course of his preaching, he covered more than 50 types going through Joseph’s life from Genesis 37-Genesis 50, and the illustrations were coupled with power from the Holy Ghost. Personally, I can say that the series of messages were very timely for me as they served as a good refreshing of the richness that I have been freely given by His gracious love. With the close of each sermon, I was aching to go again as good preaching has a way of making the heart yearn and long for more. During our Sunday night service, I attempted to preach on Judah being a type of Christ in Genesis 43 by standing as Benjamin’s surety just as Christ stood as our surety. Obviously, my mind had not left the general portion of Scripture that Brother Mark had dwelled in throughout the meeting. We are thankful to all our visiting brethren and sisters that came to worship with us. The refreshing we had at Cool Springs was enjoyed and felt by many in other local bodies. Most of all, we stand amazed and in awe of the unfathomable mercies of God unto us. When I consider my personal failings, I often wonder why God would even want to meet with me in such a special and intimate way in His church. Doubtless, the experience of the saints that assembled with us this weekend is similar. We fail Him so often, and we fall short every day. Yet, as we heard declared powerfully, He has never failed us or fallen short of His purpose. He is still pleased to dwell with weak and failing creatures such as we. He still desires to be with us! What matchless grace and love! Elder Mark Quarles (Madison, MS) – pastor of Providence PBC in Stringer, MS. Many times, the Lord blesses a meeting to have "just what we need" in it. This weekend was one of those times. My week and immediate lead-in to the weekend was surrounded by the devil's assaults. He worked on overdrive and overtime to get ahold of me and injure the receptiveness of my spirit going into the meeting. However, the Lord's mercy shined forth in refulgent fashion. Talking to the members at Cool Springs, it seems that all had similar onslaughts as I did. The Lord smiled upon us in the wake of such bitter warfare, and the rest seemed even sweeter. May His holy name be praised. 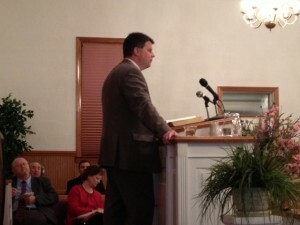 Several have asked about copies of the sermons, and they will be posted to our website at http://coolspringspbc.org/. If you would like to listen to the preaching efforts at this meeting, please click HERE for the list of sermons.